Having to give up a pet is one of the most heartbreaking things a human could do, but sometimes it has to be done for the pet’s wellbeing. That’s what one Connecticut resident found after they became homeless and were living in their car for two months. 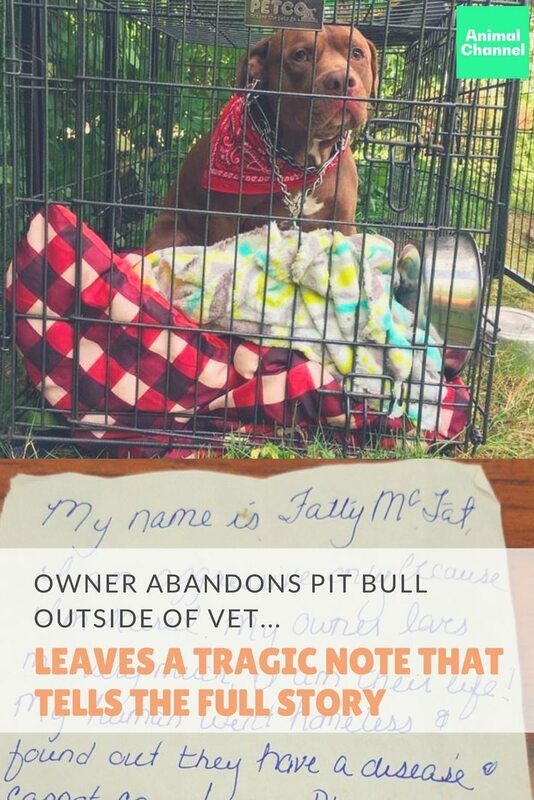 They could no longer care for their pit bull and felt it was unfair to keep the large dog, named “Fatty McFat,” cooped up in a car. So, they decided to find a new home for their dog even though it would break their heart. According to InspireMore, after reaching out to 50 different organizations, the owner couldn’t find a single person to take Fatty in since he had a habit of snapping when he felt threatened or that someone was threatening his owner. 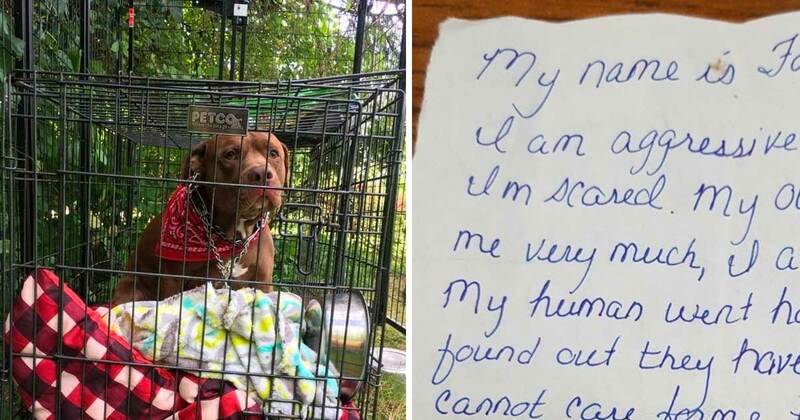 In an act of desperation, the owner left Fatty under a shaded tree of the Litchfield Hills Veterinary Animal Hospital with a note attached to it and all his belongings, like his blankets and toys. “My name is Fatty McFat. I am aggressive only because I’m scared. My owner loves me very much, I am their life!” the note read. 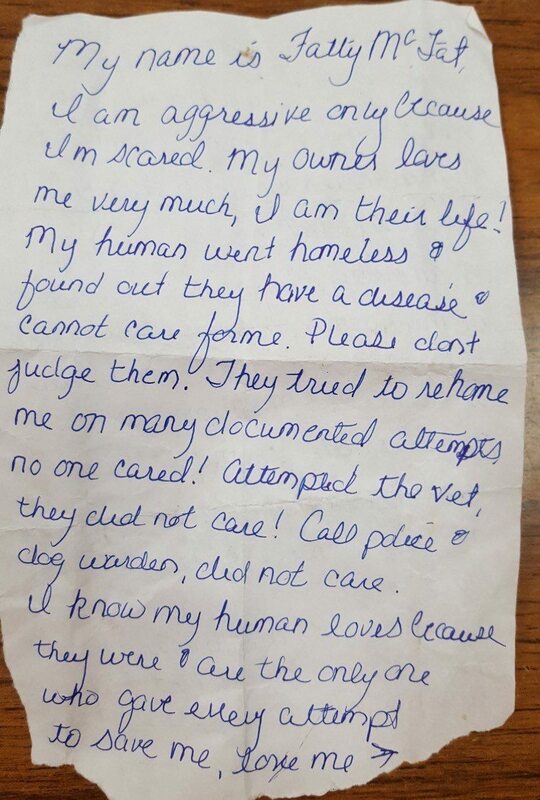 “My human went homeless and found out they have a disease and cannot care for me. Please don’t judge them. They tried to rehome me on many documented attempts. No one cared! Attempted the vet, they did not care! Call police, dog warden, did not care. I know my human loves because they were and are the only one who gave every attempt to save me, love me, and pamper me. It is not fair for me to live in a car which I have been for 2 months and my human cries everyday that they are sorry and love me. I am very, very overly protective of my human and will bite anyone who comes near them or I feel is a threat. My human went homeless due to my biting. 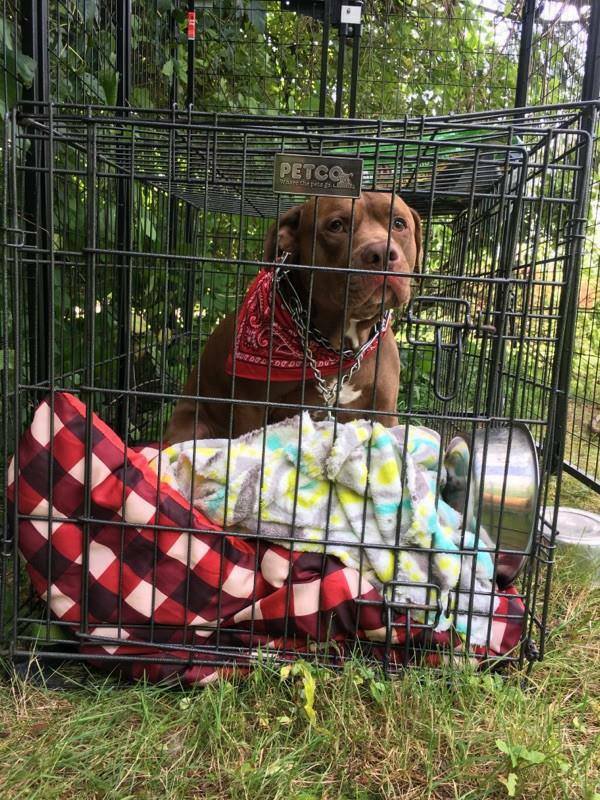 An article in Patch quotes Harwinton Town officials who stated that abandoning a dog is never appropriate without notifying officials and that there are options to help. 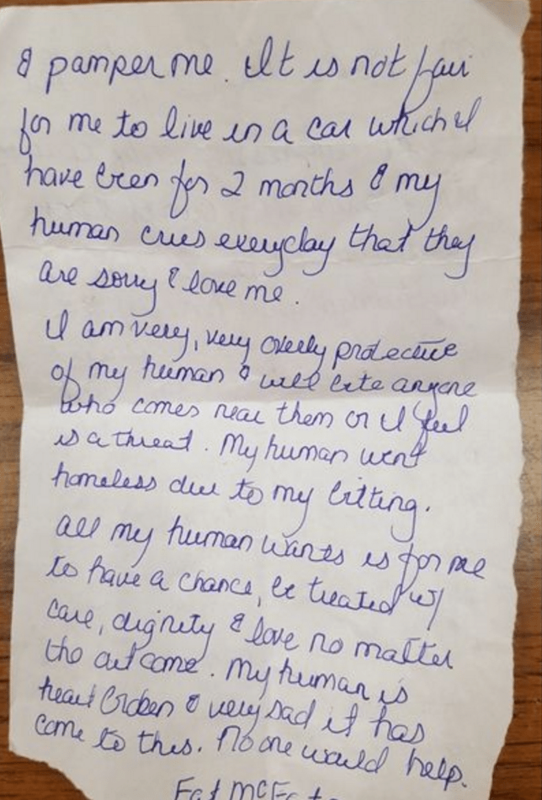 Unfortunately, this woman was driven to “abandoning” her dog because the local dog warden and several other places and local organizations didn’t explain to her that she could have taken her dog to a place like The Simon Foundation. You’d think the outlets that the owner had documented contact with would be aware of those types of services and would share that information with the public. That, allegedly, wasn’t the case. The Town officials stated that people are the ones that need to educate themselves on what to do in these situations. Thankfully, Fatty was handed over to The Simon Foundation who agreed to house the dog until the owner is able to bring Fatty home. The Simon Foundation often takes in animals in crisis situations, according to Patch. InspireMore reports that Fatty’s owner recently found a full-time job and intends to be reunited with Fatty once she has a stable home for him. In the meantime, The Simon Foundation says that he has settled into his temporary home nicely but looks forward to returning to his mother. You can donate to The Simon Foundation to help them help pets like Fatty and their owners here. Hopefully, it will help them to educate the public about their services.